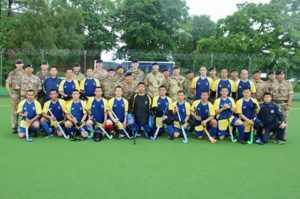 10 Queen’s Own Gurkha Logistic Regiment become the British Army Army Hockey Champions on 17th May 2017. The final was played in Aldershot against the Army HQ team. After full time the score was level at 2-2 with 10 QOGLR winning a penalty final (flicks) 3-0. A sport not normally associated with Gurkhas has been tackled head on. With some superb coaching and leadership from Staff Sergeant Harka, Sergeant Ball, Corporal Hillier and Corporal Dibendra and with the courage and tenacity of every team member to learn and and give it their all this incredible group of soldiers have secured an historic victory, they are the 2017 British Army Hockey Champions. 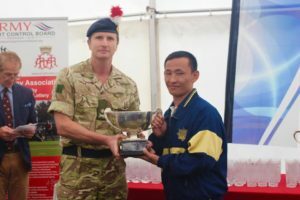 The British Army Champions trophy was presented by Maj Gen Nanson CBE the Chairman of Army Hockey and currently the Commandant of The Royal Military Academy Sandhurst.